This unique Green Sea Turtle Doorbell is hand painted to creates a seaside motif at your door. Displaying this doorbell will help you project a spirit of relaxed living from the door of your home. 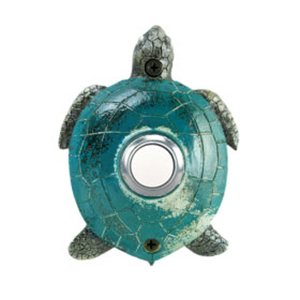 The sea turtle being the symbol of ocean deep is the perfect pick for a doorbell. This resin doorbell is crafted using the sand casting technique. This coastal doorbell is easy to install and will add the nautical personality to your home. Colors are even more vibrant then shown. Give that coastal feeling to your guest starting at the front door.